Joseph Heller was a Coney Island kid, the son of Russian immigrants, and a military vet whose experiences flying missions over France during World War II would become the inspiration for an American classic, CATCH-22. Throughout his life, Heller was well-loved and surrounded by famous friends, among them Mel Brooks, Zero Mostel, Kurt Vonnegut, Mario Puzo, and Dustin Hoffmann. When he passed away in 1999, Heller left behind a body of work, including the novels SOMETHING HAPPENED, GOOD AS GOLD, and CLOSING TIME, that have remained in print and continue to influence readers throughout the world. JUST ONE CATCH is the first major biography of Yossarian’s creator, written with full cooperation from the Estate. [L]iterary biographer extraordinaire Daugherty traces the slow brewing of Heller’s now-classic satirical war novel, CATCH-22 . . . Brilliantly detailed and constructively analytical, Daugherty’s groundbreaking portrait of the prophetic, contradictory, and essential Joseph Heller is dramatic and revelatory. —Donna Seaman, Booklist, STARRED REVIEW, 6/1/2011. Daugherty has a natural feel for the texture of Heller’s worlds, both physical and cultural . . . Essential reading about a writer whose major novels continue to command attention. Daugherty serves up a breezy, entertaining, and well-researched biography worthy in tone and scope of his subject . . . [an] adroit . . . portrait of the artist who dared to bring a humorous sensibility to the tragedy of modern warfare. There’s no catch. Tracy Daugherty has written a generous, smart and comprehensive biography of a 21st century American master. Buy this book! 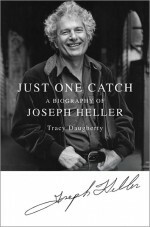 JUST ONE CATCH is a truly smart and compelling biography of a major American writer. Joseph Heller wrote our greatest war novel and made a lasting contribution to the idiom, but he was also a singular figure through decades of cultural transformation. Tracy Daugherty deftly situates Heller’s role in the American saga while never losing sight of the man, his grand literary quest, his huge personality, his politics, his passions, his weaknesses and kindnesses, his appetites. JUST ONE CATCH is not only an intricate and compassionate portrait of its subject, but also an absorbing account of the genesis of the novel that transformed mid-20th century American discourse. And even more than that, it’s a revelatory and moving social history: a reminder of a now-vanished culture in which the literary and the political informed one another in the most crucial and formative ways. Tracy Daugherty’s JUST ONE CATCH does double duty as a book. In addition to chronicling the life of an iconic American novelist, it also provides a kind of literary equivalent to TV’s MAD MEN, pulling the reader into a world that eerily replicates our own, even as we thought we’d left that world long ago. The pleasure of reading this biography is in Daugherty’s ability to both frighten and reassure us that history does indeed repeat itself. Which information is a real Catch-22. CATCH-22 is the great comic American novel of the 20th century. Tracy Daugherty has given us a biography worthy of its author. A major achievement, or should I say major major major? Joe Heller’s work is more important and more meaningful today than ever. Tracy Daugherty has done his memory a great service by writing such a masterful, wonderfully thought-provoking biography about one of America’s greatest contributors to 20th century literature. Both touching and illuminating, this is that rare biography worthy of its source material.